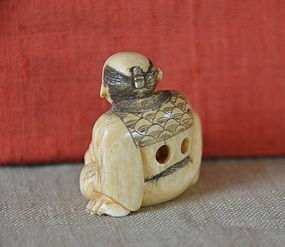 Intricately carved netsuke of man holding a gourd while sitting with legs crossed. Eyes are opened, looking upward. Eyebrows are raised. The man is leaning on one hand. Painted with black ink. A fine quality piece from the early Meiji Period (pre-1900). Signature on the base. Provenance: Acquired in the 1960s.